The newest of our Parents' Gift Collection! 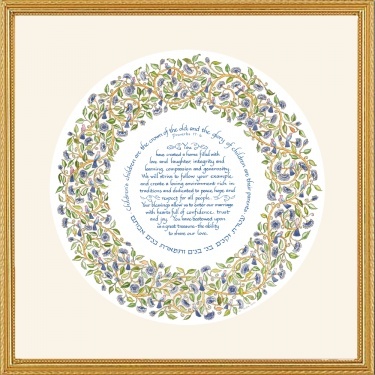 SONG OF SONGS fashioned from the famous Song of Songs Ketubah by artist Mickie Caspi. What a wonderful gift to present to your parents at your wedding rehearsal dinner or at the wedding, thanking them for all they have done! Gold framed and French Creme mat with traditional words from the Bible, Proverbs 17:6. You have created a home filled with love and laughter, integrity and learning, compassion and generosity. We will strive to follow your example and create a loving environment rich in traditions and dedicated to peace, hope, and respect for all people. Your blessings allow us to enter our marriage with hearts full of confidence, trust and joy. You have bestowed upon us a great treasure-the ability to share our love. As an option, you may have a plaque affixed to the bottom of the framed print, with your names and date of wedding and a small message (3 lines total). A treasure forever! Please write names and date in Inscription box, when ordering. We ordered 2 of these with a small personalized plaque from me and my husband and presented them to our parents the day before our wedding. They are beautiful and our parents each hung them up in their homes. Very special gift. Thank you!